UPDATE – February 13, 2012 – For up-to-date information on what the bishops are saying about the U. S. Department of Health and Human Services mandate that infringes on the right of the Church to practice our faith, visit the United States Conference of Catholic Bishops’ website. Use the link below to write Congress and urge passage of the Respect for Rights of Conscience Act. The Catholic Conference of Kentucky joins our fellow bishops and other religious leaders in expressing our deep concern about the recent decision of the U. S. Department of Health and Human Services to require that almost all employers, including Catholic employers, will be forced to offer their employees’ health coverage that includes sterilization, abortion-inducing drugs, and contraception. Almost all health insurers will be forced to include those “services” in the health policies they write. And almost all individuals will be forced to buy that coverage as a part of their policies. In so ruling, the Administration has cast aside the First Amendment to the Constitution of the United States, denying to Catholics our nation’s first and most fundamental freedom, that of religious liberty. And as a result, unless the rule is overturned, some Catholic employers will be compelled either to violate their consciences or to drop health coverage for their employees (and suffer the penalties for doing so). The Administration’s sole concession was to give these institutions one year to comply. 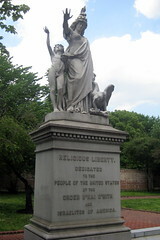 The further fact is that forms of government still exist under which, even though freedom of religious worship receives constitutional recognition, the powers of government are engaged in the effort to deter citizens from the profession of religion and to make life very difficult and dangerous for religious communities (DRF, p. 15, 1965). It saddens us that the Administration is making life difficult for Catholics and other believers by infringing on their right to the free exercise of religion. One way the exercise of religion – religious liberty – takes concrete form is in institutions established by people of faith to help members of society. Whether it is education, health care, social charities, worship or another activity, each activity is an expression of faith. Each one has a unique quality flowing from that basis of faith. To deny that underpinning of faith is to change the very character of the institution and of the service it provides. This ruling by HHS denies this underpinning of faith. It ignores the diverse ways through which faith is expressed. It forces people to act against their free, conscious decisions made in the light of faith. Government therefore ought indeed to take account of the religious life of the citizenry and show it favor, since the function of government is to make provision for the common welfare. However, it would clearly transgress the limits set to its power, were it to presume to command or inhibit acts that are religious (DRF, p. 3, 1965). In addition, we urge Congress to enact legislation that would reverse the Administration’s decision and end this assault on our religious liberty now and in the future. In closing we ask the Catholic community of Kentucky to join together in prayer and fasting that wisdom and justice will prevail, and religious liberty will be restored. Further, we urge you to visit www.usccb.org/conscience, for more information on this issue and to learn how you can contact our members of Congress and ask them to vote for legislation that would reverse this decision. Bishops Foys’ letter regarding the HHS decision (on the home page now, but subject to move so may not be available later.